I shop at “big box” stores as much as anyone else. Around here, there doesn’t seem to be much of a choice. We don’t have a Main Street in town; instead, it’s strip malls along a state highway. But when we (infrequently) host parties, we’ve always gone to Party Land to get our supplies. Because of the store’s location, it’s close but inconvenient–less than 1/2 a mile to get there but three times that to get home. It’s worth the trip, though; it’s a local business and we’d rather purchase plates, cups and tablecloths there than at (insert name of big box store here). As the kids have gotten older, birthday parties have gone by the wayside, so except for graduations, we haven’t needed to visit the party store. I go there every February to stock up on colorful tablecloths for the Cub Scouts’ Blue and Gold Dinner. This year I did that shopping a little early, because Party Land won’t be here in February. Just before Christmas, Party City opened directly across the street, in a strip mall owned by the same landlord. It’s got the advantage of a location with much more foot traffic. I told Little Brother when we first saw the signs for Party City that Party Land would close within a year. Unfortunately, it only took a month. So yesterday I headed over to Party Land before it closes its doors for good–to pick up blue and gold tablecloths for next month’s Cub Scout dinner. As I told TheDad this morning, I felt really crummy doing so. And I don’t quite understand why. I needed to get those tablecloths anyway. 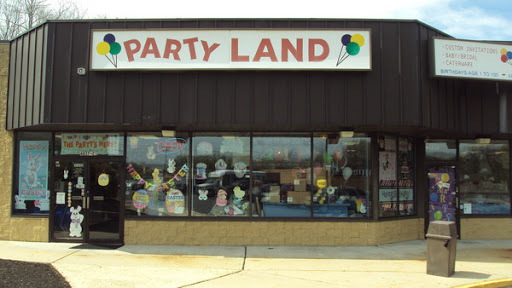 I was going to buy them at Party Land anyway. I just wasn’t going to buy them until February. Yet when I walked into that store yesterday, it was crowded with five times more customers than I’d normally see in the middle of a school day. People were loading up carts with all kinds of things, squealing over going-out-of-business bargains. All I bought was a dozen or so blue and gold tablecloths. That didn’t stop me from feeling rotten as I stood in line behind people with loaded-up shopping carts. I’m glad that this will be the last year I do a Blue and Gold Dinner. I don’t think I could stomach getting those tablecloths at the competition. And now my town will have one more empty storefront as one more family business owned by a local guy for over 25 years will close its doors. That doesn’t really feel like progress to me. I know how you feel. The best hardware store in the area closed up within the last couple of years. You could walk into that store and the owner would have what you need and could tell you how to use it. Now we are left with Home Depot where no one has a clue if you ask for anything unusual. I really do try to utilize the mom and pop shops whenever I can. It seems they are getting fewer and fewer.